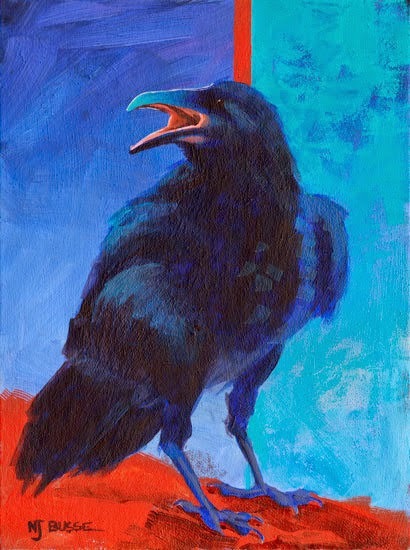 This is a portrait of one of my favorite ravens. We've had a pair hanging around the house for years. In the spring of 2013 our pair had a very successful reproductive season. They showed up in May with 5 fledglings!! One of the fledglings was bolder, more curious, and more raucous than the rest of the brood. All summer she visited me in my studio daily. I named her Violet. By the end of September, all of the fledglings were gone and we were back to our usual pair. I hope Violet is fine and doing well.